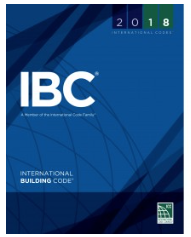 Across the United States, the International Building and Fire Codes created by the International Code Commission (ICC) have become the standards most commonly adopted for the design and protection of new and renovated buildings. The purpose of the Building Code is to establish the MINIMUM REQUIREMENTS to safeguard the public health, safety, and general welfare . . . and SAFETY to LIFE and PROPERTY from fire and OTHER HAZARDS attributed to the built environment and . . . to provide SAFETY to FIREFIGHTERS and EMERGENCY RESPONDERS DURING EMERGENCY OPERATIONS. Similarly, the Fire Code states: The purpose of this code is to establish the MINIMUM REQUIREMENTS . . . consistent with NATIONALLY RECOGNIZED GOOD PRACTICE . . . for providing a REASONABLE LEVEL of life safety and property protection from the HAZARDS of FIRE, EXPLOSION or DANGEROUS CONDITIONS in new and existing buildings, structures and premises . . . and to provide SAFETY to FIRE FIGHTERS and EMERGENCY RESPONDERS DURING EMERGENCY OPERATIONS. Forty-eight of the fifty United States have adopted the International Building codes at the state level and the remaining two have adoption at the local level. 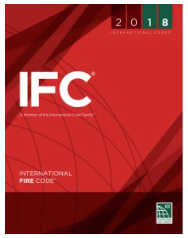 Forty-two states have adopted the International Fire Code with the remainder following NFPA (National Fire Protection Association) standards – which typically parallel the ICC. All ICC codes are updated on a three-year with the most recent update in 2018. Most states adopt the latest code version within 12 - 18 months. In addition to the actual codes, the code development process brings together building professionals on a regular basis. It provides an international forum for discussion and deliberation about building design, construction methods, safety, performance requirements, technological advances and innovative products. How Are The Codes Enforced? Adoption of the latest Building and Fire codes is only part of the safety solution. Codes must also be effectively and uniformly enforced to ensure that buildings and their occupants benefit from advances in technological provisions in the codes. When hazardous materials are involved, this process begins with a Hazardous Material Opinion and Report, performed by a qualified firm or person approved by the Building Official, which identifies the hazards and the applicable codes and appropriate methods of protection. Enforcement of the codes falls to the Authority Having Jurisdiction (AHJ). Only the AHJ has the ability to “approve” a design and installation. They do so by looking at the “prescriptive” language included in the codes and when the prescriptive language is silent, requiring a performance-based solution to accomplish the intent of the codes. Primarily, code enforcement falls into two areas of responsibility. First are the Building Inspectors - local government Building Officials who review design plans; inspect construction work and issue building and occupancy permits. Once the building is completed and occupied, Fire Inspectors visit each building annually to verify that required Life Safety systems – including Hazardous Material Emergency Alarm Systems - are maintained according to the provisions of the original Building Permit(s) and Certificate(s) of Occupancy. Ino-Tek maintains strong working relationships with Code Officials around the country. When hazardous materials are involved, our Proactive Compliance approach and code expertise helps ensure your project is approved on schedule. Our Educational outreach programs and code development involvement affords us the opportunity to develop trusted relationships with local code–enforcing authorities. Community inspectors across the country trust Ino-Tek designs, installation, and service when dealing with hazardous materials. Additionally, Ino-Tek’s unique understanding of Hazardous Material Emergency Alarms systems and the portions of the building and fire codes dealing with hazardous materials have helped owners implement cost-effective safety solutions that drastically reduce construction costs by applying creative solutions to building classification issues. In some cases, Ino-Tek has worked directly with the AHJ to develop and propose “equivalencies” required when requesting “alternative installations or modifications” where certain requirements might be impractical or when new processes, technologies or materials have not yet been recognized by the codes. Finally, our design, installation and service expertise may even lower your maintenance and utility costs by reducing the required heated and cooled makeup air by operating ventilation systems intermittently. The Ino-Tek approach to use the required Life Safety / Hazardous Material Emergency Alarm System to reduce your carbon footprint is unique in the safety industry. For over twenty years, Ino-Tek has been part of the conversation about Hazardous Materials, the requirements of the Building and Fire Codes and cost-effective implementation for the owner. Our years of association and consultation with national, state and local building and fire code organizations, plus our professional staff's knowledge of the code change process, gives us the background and experience to recommend effective code-compliant solutions. Our Proactive Compliance approach prevents approval issues that might cause design changes, add costs and delay building occupancy. Our primary goal is to “Keep Your People Safe”. We do this by deploying proven and tested engineering practices in the most cost-effective means possible. For more than 20 years we have built a reputation for Life Safety / Hazardous Material Emergency Alarm System design, installation and service combined with integrity and customer service – earning the loyalty of virtually all auto manufacturers and their suppliers, universities, hospitals and even the United States Environmental Protection Agency.